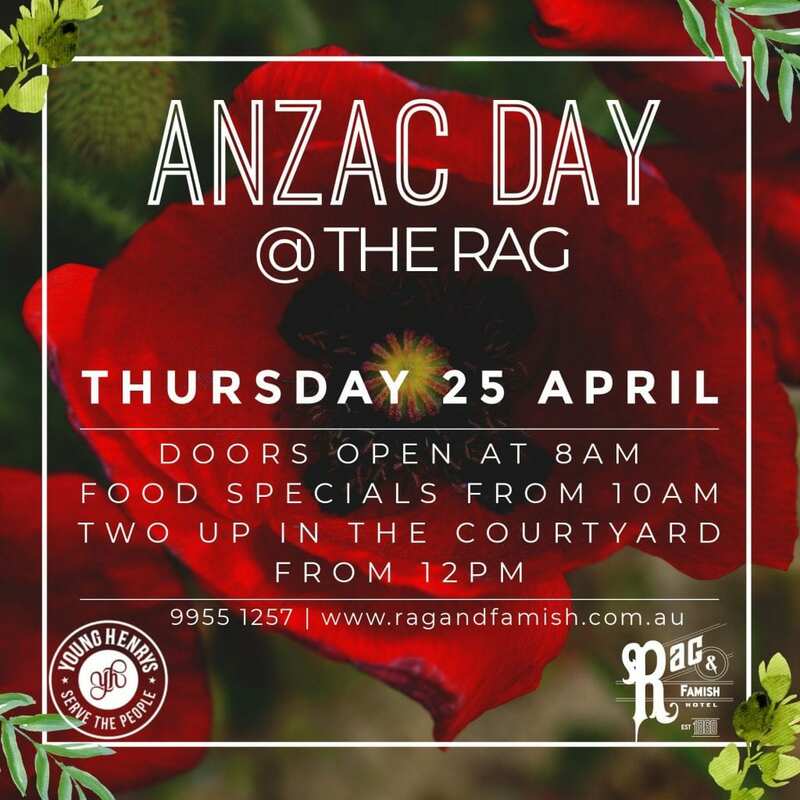 Come celebrate the legacy of our Anzacs at the Rag on Thursday the 25th of April. We will be opening our doors at 8am, with food specials available from 10am, and a great day of Two Up with the crew from Young Henry’s. 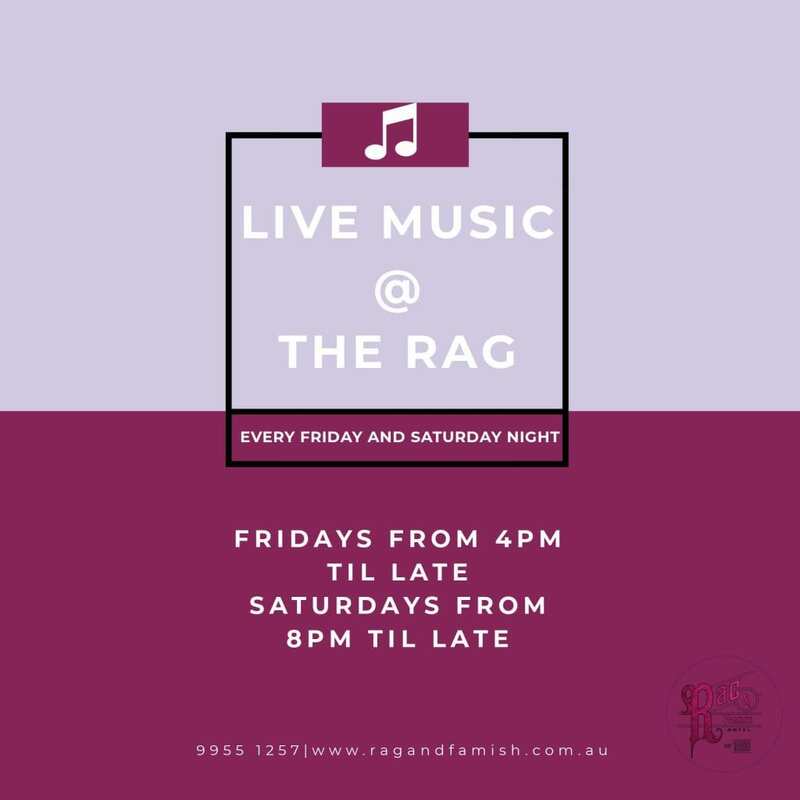 With tons of Aussie classics on tap, head down to the Rag to celebrate those serving our country past and present. 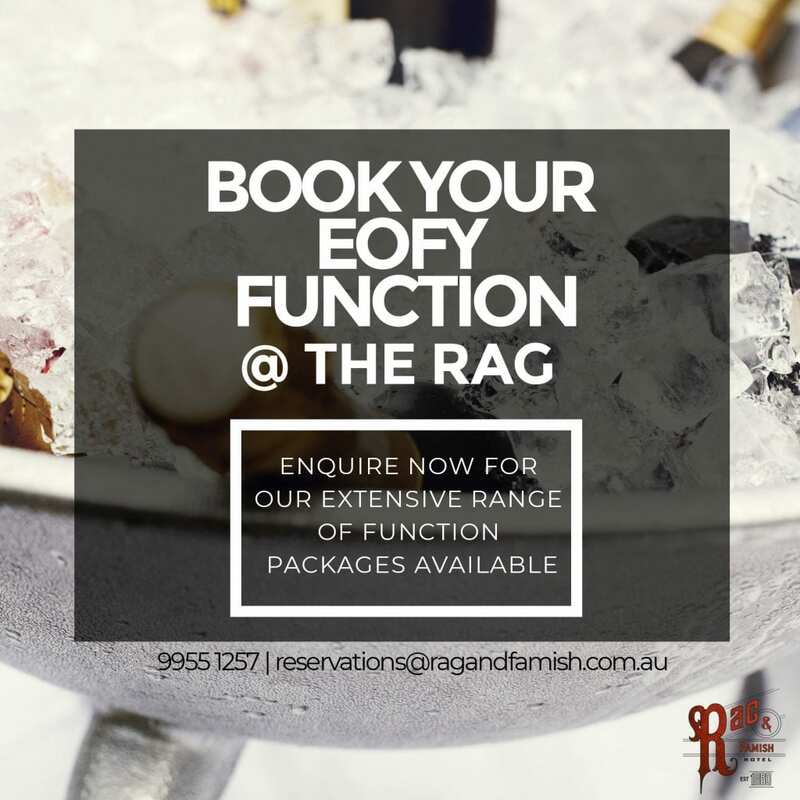 Looking to book your EOFY function? We have a wide range of spaces and packages available for booking, exclusively tailored to suit your needs. From private dining to whole floor book outs, make sure to enquire with our team today. Get in quick – bookings confirmed before the 1st of May will receive complimentary cocktails on arrival for their group! A new addition for 2019! 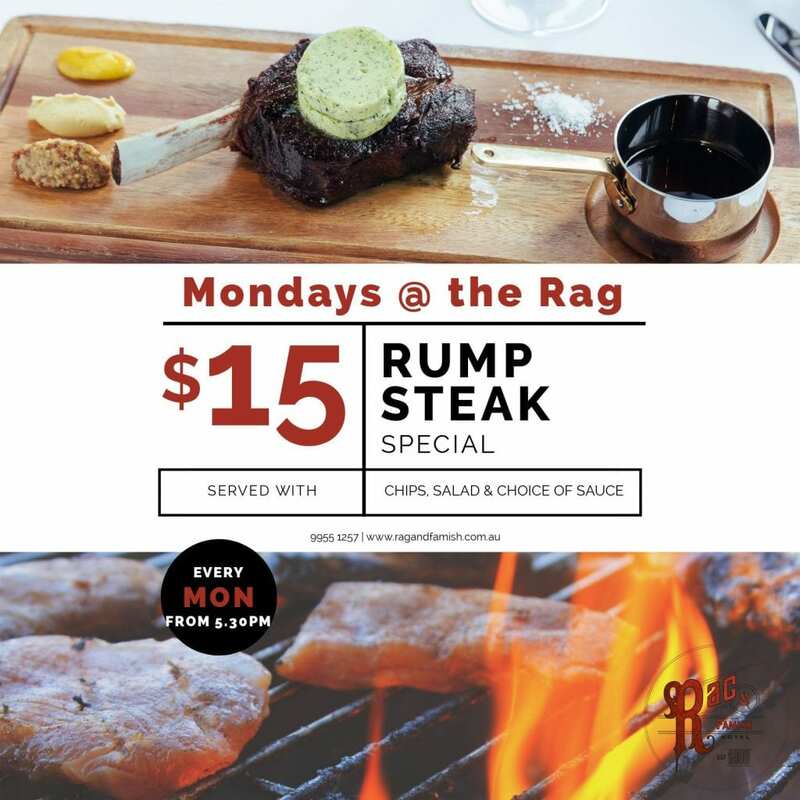 Every Monday from 5.30pm in the downstairs bistro grab a Rump steak for $15, including chips, salad, and a choice of sauce. 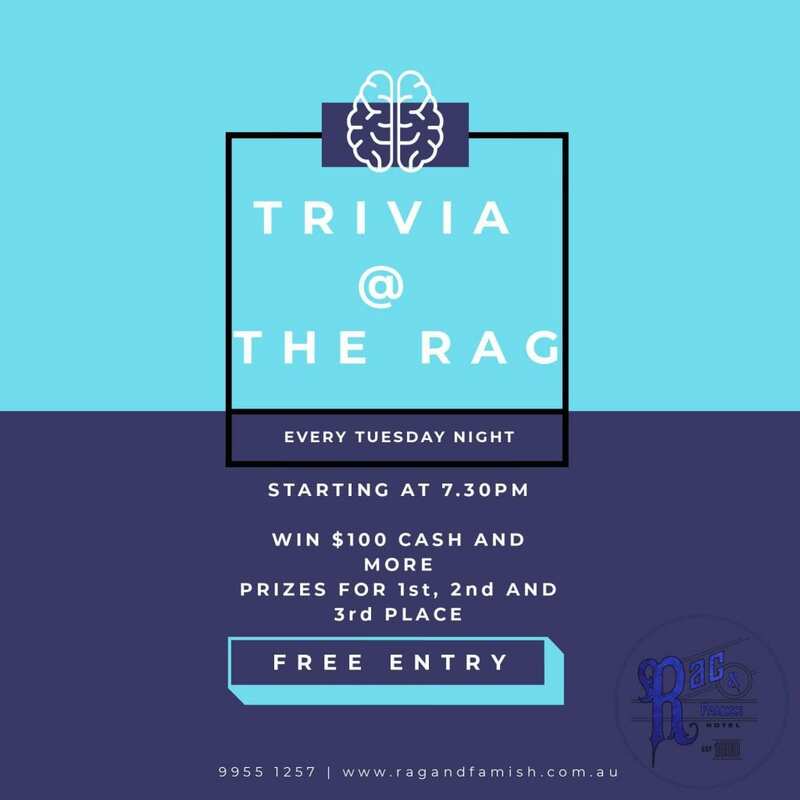 Head down on Tuesday nights for trivia starting at 7.30pm. With loads of giveaways and some great prizes on offer, this is always a fantastic night of fun. Grab your smartest mates and try and take home the gold! Fridge looking a little empty? You’re in luck! 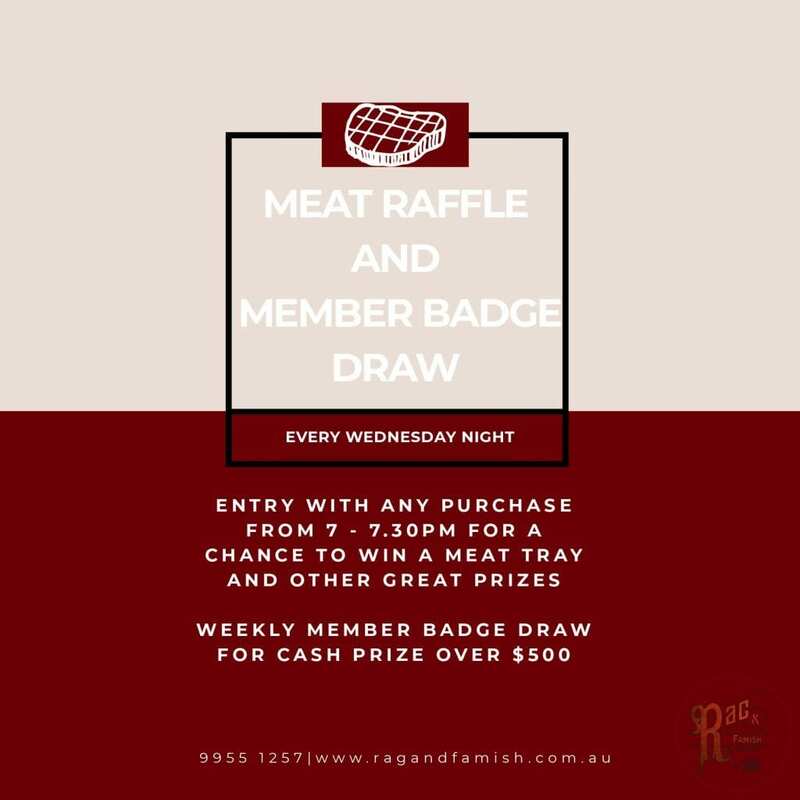 We give away meat raffles as well as some other awesome prizes, including Rag merch, drink vouchers and bottles of wine every Wednesday night. Any drink purchase from 6 – 7.30pm enters you into the raffle, drawn at 7.30. We also have our weekly members badge draw, for a cash prize of over $500! 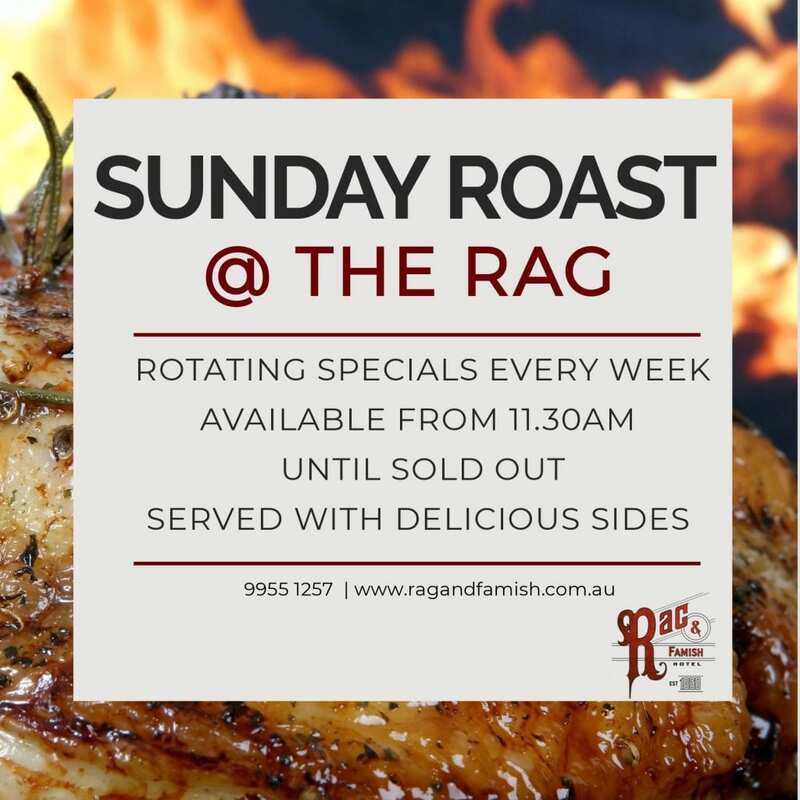 Introducing our new Sunday Roast to the Rag! Every Sunday we will have a different slow roasted special on offer, for only $19.50. Available from 11.30am until sold out, and served with classic Yorkshire Pudding and delicious sides, this is the perfect feast to tuck into at the end of your weekend! Live Music downstairs ever Friday from 4pm, plus every Saturday (with the exception of Karaoke Saturday) from 8pm! Don’t miss out on our exciting Karaoke Night! This occurs on the last Saturday of every month! 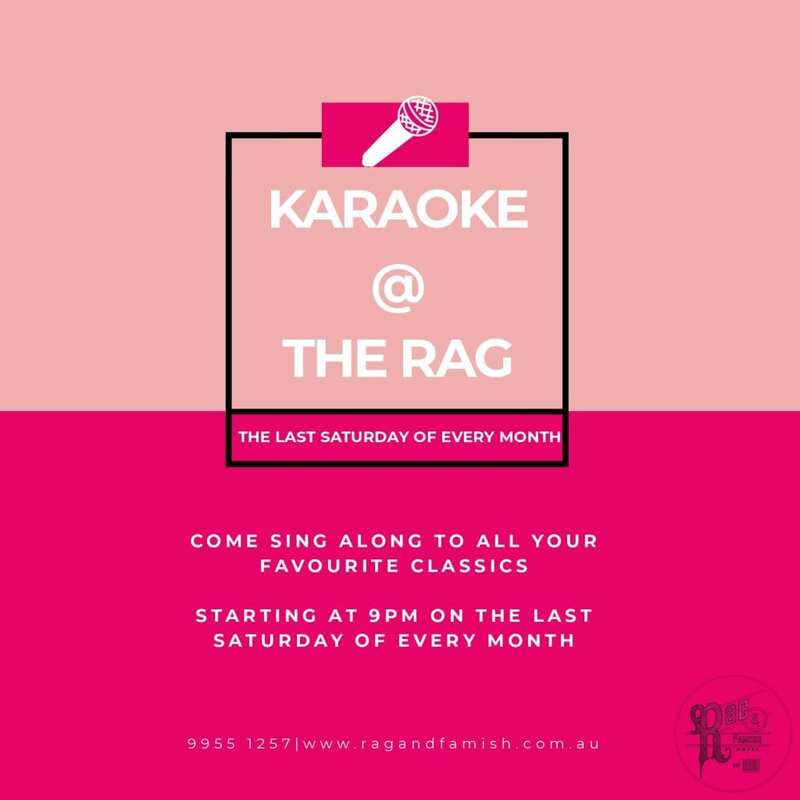 So grab your singing buddies and head on down to The Rag! Don’t miss any of the sporting action this season! 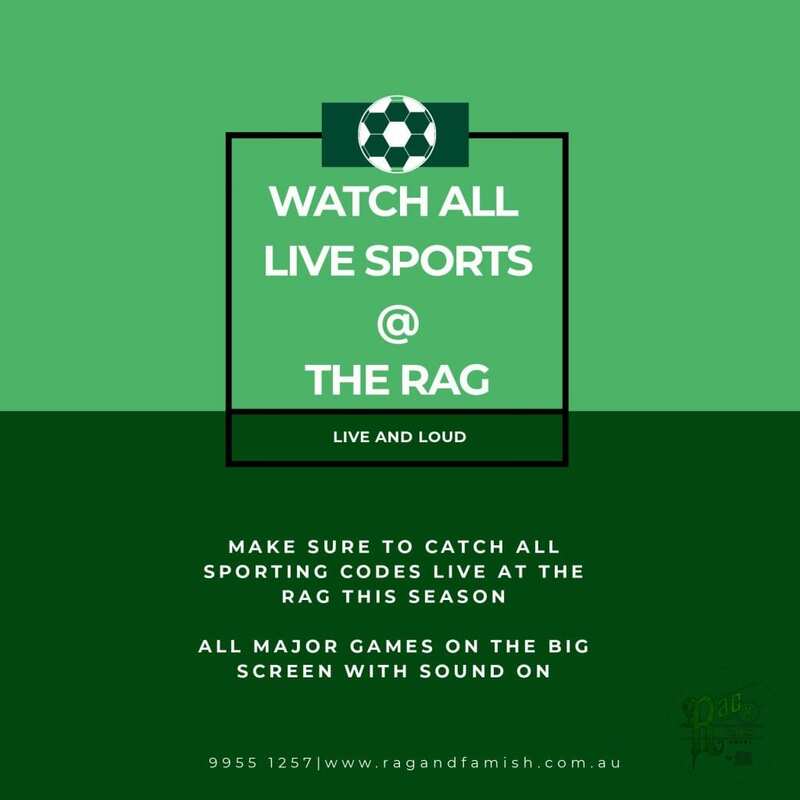 Catch all codes LIVE in our Sports Bar downstairs.